What is the process for handling warranties? All warranties are now processed online and once you become an applicator we will show you how to do it. How do I file a warranty claim with HouseGuard? 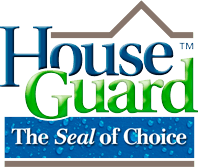 Please contact HouseGuard customer service at 855-9HG SEAL (855-944-7325) and tell them you are filing a warranty claim for waterproofing repair. You will be sent an sheet requesting information pertinent to your basement necessary to process the claim. Complete the form and return it to HouseGuard, either email or regular mail. Once received and processed which takes a week or two, we will be in contact with you via phone or email. If the warranty claim is valid, HouseGuard will contact a local contractor to make the repair. All repairs will be warrantied. Can we utilize email for warranty documents? 10 year -TruDry waterproofing membrane on poured walls. 5 year performance warranty includes TruDry or TruDryXG and Dow Perimate, Green Jacket or Delta Drain.